International Engagement Volunteers (IEV) is dedicated to support and contribute to the lives of disadvantaged populations in Oaxaca, Puebla, Merida and Campeche, Mexico through various events and donations. 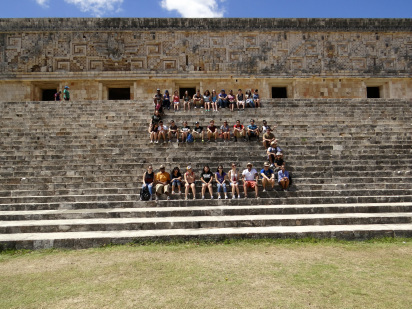 IEV is in supportive collaboration with the Michigan State University International Engagement in Mexico study abroad program. Fundraisers include: Cedar Point, traffic control during MSU football season, can and bottle collections, food sales & raffles. The IEV community is made up of City site leaders in the IEM study abroad program and dedicated MSU students. IEV, as MSU Spartans are dedicated and passionate in making a difference.
" It shall be the mission and purpose of International Engagement Volunteers to make a difference in the communities at the fringe of Mexico’s society. We seek to achieve this endeavor by coordinating fundraising events whose proceeds are used to attain goods and materials necessary for International Engagement in Mexico (IEM) to perform the required volunteering duties while abroad." IEV is more than just a resume filler to show that you did community service. The experiences IEV provides for each student are priceless. Not only do members learn about the work and organization behind a non-profit, they become confident leaders with valuable experiences that most college graduates do not have. Every week we work to overcome obstacles and challenges. It is not easy to make a decision with over fifteen people carrying different ideas. IEV provides students with the opportunity to work as a team and find solutions to problems and ideas to reach our fundraising goals. Each student has a responsibility, whether it be help with advertising, promoting fundraising, running fundraisers, or anything else. Members of IEV get a chance to be creative and think outside of the box, something you cannot always do in the confines of a classroom.